Blackcurrants. Ribes nigrum (Escalloniaceae (Grossulariaceae)). The species grows wild in central and eastern Europe, and in northern and central Asia to the Himalaya. It produces a shrub to about 1.2m. The strong flavour of the fruits delayed acceptance of their use for eating, and early references in the literature are to its use for flavouring, in colouring wines, and in medicine. The first mention of their use as a dessert was by Caspar Bauhin in 1671. By the early 18th century there are references to garden cultivation, and selection of cultivars with larger fruits followed. Dutch, French and English nurserymen introduced new cultivars such as ‘Boskoop Giant’ and ‘Merveille de la Gironde’ (=‘French Black’) towards the end of the 19th century. For most of the 20th century government research stations have been the source of new cultivars, and genes from new species other than Ribes nigrum have been used to introduce characters such as larger fruits on longer bunches, extended harvest period and resistance to pests and diseases. 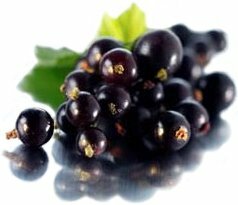 Since the 1950’s, the blackcurrant industry has been transformed by the demand for its juice, which has the highest content of vitamin C in any fruit, and by machine harvesting. The major commercial producers in Europe are Poland and West Germany, Followed by other east European countries and Norway. The major use for the fruit is for juice but there is also some demand for jam and for wine colourants and for liqueur (cassis). There is a minor demand for the essential oil in the buds (gathered in winter), which is used as a perfume base. In the US interest in growing blackcurrants has been slight because the plant is an alternate host to white-pine blister-rust fungus. Recently, as white pine has become less widespread, interest in growing Ribes is being revived, but it is still a relatively unimportant crop. 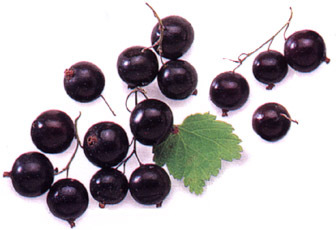 Blackcurrants are grown most satisfactorily in cool moist climates such as northern Europe, Canada and New Zealand. The fruiting season is from mid-summer to early autumn. The blackcurrant’s cold requirement of low temperature to break winter dormancy is longer than that of other fruits, which makes cultivation in warmer climates less predictable. Even in cooler climates the fruit has a reputation for irregular cropping, as flowers may be damaged by spring frosts (of –1ºC). The climate in spring is crucial for good yields. When choosing a site avoid a frost pocket and the shade of trees. Shelter from cold winds, especially at flowering, is essential, for blackcurrants are partially dependent on insects for pollination and these will not fly in windy conditions. Blackcurrants grow best on well-drained, deep (60cm at least), medium to heavy loamy soils containing humus, but will grow on other soils in the pH range 6.7-7.0, as they respond to careful manuring. They will tolerate acid soils. Plants are usually grown as stooled bushes, the branches arising at ground level. In some commercial plantations in Europe they are grown on a short stem (up to 40cm), the shoots tied to post and wire support for easier harvesting by machine. Yields from this system are generally lower than from bushes, and not all cultivars are adaptable. Most cultivars are self-fertile, but in several the style within a flower is too long for its own pollen tube, and foreign pollen is more successful. Cross-pollination is by wild insects and hive bees, but in cold seasons the wild insects are more active. ‘Running off’, when the lowest fruits within the strig drop off after seeming to set, has customarliy been attributed to inadequate pollination, but fungus infection and frost damage may also play a part. It is essential to start with healthy plants, and there are various schemes throughout Europe for the certification of plants based on visual inspection as true to type and free from disease. Planting distances for bushes in the garden are 150-180cm between plants and rows, the wider spacing on more fertile soils and with more vigorous cultivars. For commercial growers who harvest by machine, plants are closer within the rows (60-90cm) or may be set in multiple rows with a wider alley for the machines. Before planting the soil is cleared of all perennial weeds, and organic material incorporated, from a 5-7.5cm layer over the whole area. Plant in the dormant season, when the weather is open and the soil not too wet or frozen; planting as soon as possible after leaf-fall will encourage root growth while the soil is still warm. Plant the bush firmly about 2.5cm below the level that was in the nursery, to encourage new shoots from below ground level. All shoots are cut back to a bud at 2.5-5cm above the soil. No pruning is done in the following winter unless growth has been poor and needs to be stimulated. Pruning for fruit is based on the fruiting habit of the black currant which produces the best fruits on one-year-old shoots. Good fruit is also carried on two-year-old and three-year-old shoots but quality declines on older wood. Such wood is cut out, removing a quarter to a third of the bush annually, so stimulating the production of new shoots from the base of the plant. To maintain the continual production of new shoots, the primary need is for nitrogen. Apply 30g/m² of nitrochalk or sulphate of ammonia (according to soil acidity/alkalinity) in late summer every year. An annual top-dressing (mulch) of some organic material will help to maintain the humus content of the soil and supply some additional nitrogen; spread an 8cm layer over a 45cm radius around the bush. On lighter soils an annual application of sulphate of potash – 25g/m² in winter may be needed. Phosphate is needed at planting and in the early years to encourage good root development. Minor element deficiencies are rare, but excess potash induces magnesium deficiency so care is needed to keep the balance. The critical period for water uptake is in early summer when fruits are swelling. Water during dry periods at this time (2.5-5cm), at the base of the plant. Mulching with organic materials will help to control weeds; herbicides are used in commercial plantations. Any soil disturbance around the bushes, even shallow hoeing, will damage surface roots and trials have shown that higher yields are obtained from bushes in non-cultivated soils than in cultivated soils. In hand picking, the whole bunch is picked off the node, preferably when dry. Machines are widely used for harvesting in commercial plantations. These travel between or over the rows shaking the fruit off the branches; the fruit and leaves travel along a conveyor belt and the leaves are separated out by an air stream. Systems of destructive harvesting, i.e. cutting the branches at ground level and taking them to the harvester, were considered to be unsatisfactory as the hard pruning resulted in too much vigour, but are still used in some areas. Propagation is commonly from hardwood cuttings. One-year-old shoots, about 20-25cm long, are taken from healthy plants in early autumn after leaf-fall; the top 2.5-5cm of unripened wood is removed and the shoots are inserted in a trench so that the top two buds are left above soil level. They will have rooted after about a year and can be transplanted to a nursery row for a further year’s growth. Softwood cuttings can also be taken in summer and rooted under mist. Layering may also occur naturally. ‘Baldwin’: mid-season to late season, moderate vigour, good yield. ‘Ben Lomond’: mid-season, some mildew resistance, good flavour and yield; ‘Ben Sarek’: mid-season to late season; low-growing and compact, moderate vigour, spreading habit, mildew-resistant; ‘Boskoop Giant’: early season, very vigorous, susceptible to spring frosts; ‘Jet’: very late season, very vigorous, but escapes spring frosts; ‘Consort’: late, vigorous; ‘Roodknop’: late season, moderate vigour, good crops; ‘Tsema’: early season, vigorous, good flavour; ‘Willoughby’: mid-season, cold-hardy. Ribes rubrum and Ribes sativum (Escalloniaceae (Grossulariaceae)). 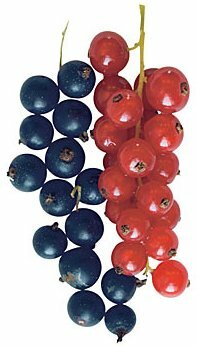 These are the two main species that include all the red and white currants, but other species have been used in breeding modern cultivars, including Ribes petraeum, Ribes vulgare and Ribes multiflorum. All are native to Europe although Ribes rubrum and Ribes petraeum are also found in Asia. 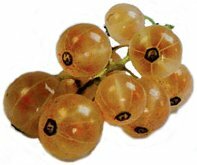 White currants differ form red mainly in the lack of cyanidin glycosides in the fruit skin; cultivation is the same as for redcurrants. The first known reference to redcurrants is an illustration in 1484 in the Mainz Herbarium. They had become well known in Europe by the 16th century, and were introduced to North America in the early 17th century. By the end of the 18th century the demand in Europe for fresh fruit was high enough to induce gardeners to develop new techniques to extend the season over nine months. New cultivars were selected in England, Holland, France and the US in the 19th century, chiefly by nurserymen, and breeding has continued into the present century by government research stations with emphasis on improving fruit yield and disease resistance. The season is mid-summer (late June in temperate Europe) for three weeks, although late-ripening cultivars may extend it by two months. In Europe the main commercial producers are Poland and West Germany, with smaller areas grown in Holland, Belgium, Hungary and France, mostly for use in mixed fruit juices. Redcurrants are of little commercial importance in the UK and are hardly grown in the US because of the problem with white-pine blister-rust. 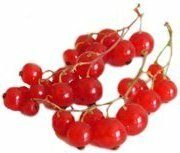 Redcurrants are fairly easy to grow in cool moist climates. They need shelter from spring winds, which may break new shoots in early summer, and from low temperatures at flowering. They tolerate shade and can be grown on a north wall, but the fruits have less colour and flavour than those grown in the sun. Although they do not need a very fertile soil, redcurrants grow best in a well-drained, medium loam (optimum pH 5.5-6). Good crops can be produced on lighter soils with careful feeding and watering. Most cultivars are self-fertile, but all will set a good crop of fruit on their own. The traditional form for growing in gardens is a bush on a short leg, but for commercial cultivation in Europe and the US they are grown as stooled bushes and yields from these are higher. They may also be grown as standards (grafted on Ribes aureum, or grown on their own roots), cordons, espaliers or fans. Spacing depends on the form and vigour of the cultivar. Bushes in the garden are planted at 1.5 x 1.5m to 2 x 2m apart. In commercial plantations spacing is related to the machinery used, commonly 3.5m between rows, although double rows may be planted with 2.5m between the two rows. Within row spacing is 0.5-0.7m. Two-year-old bushes are most usually available from nurseries, commonly with a guarantee that they have passed a visual inspection that they are true to type and free from pests and diseases. It is essential to start with healthy plants. Pre-planning preparations include improving the drainage if necessary, removing perennial weeds, and incorporating some form of organic material to increase the humus content. Planting in autumn after leaf-fall is ideal as there will be time for some root growth before winter, but it can be done at any time in winter when conditions are good. Bushes need no support, but standards need to be staked, cordons need a cane (or two canes if a U-cordon) and espaliers and fans need wire structures for support, either as a fence or against a wall. Redcurrants fruit on buds set at the base of one-year-old and older shoots, and will start to fruit at three to four years old from cuttings. Whatever form is used, the aim of pruning is to produce a strong framework of spur-bearing branches. In the first year or two, prune back leading shoots by half, usually to an outside bud, unless growth is drooping; then prune to an upward-pointing bud. Once the bush starts fruiting, cut the lateral shoots back to two or three buds every winter. Later, old unfruitful branches may need to be removed completely to keep the centre of the bush open. With trained forms (cordon, etc.) lateral shoots can be pruned to about five leaves, starting when the fruit begins to colour; these are cut back in winter to two or three buds. After some years the spur systems on cordons become long and branched and are cut back into the old wood to simplify them. Potash is the essential nutrient for redcurrants; apply sulphate of potash at 25g/m² or 270g/m² bonfire ash in late winter. Nitrogen is not needed regularly, and too much will tend to induce sappy growth, but on poorer soils an application of a compound fertiliser (e.g. at 60g/m²) will improve growth and fruiting. Mulching with compost or other organic material will supply some nutrients and the soil cover will control most weeds. Water during dry spells in spring and summer, at up to 50 litres/m². Control weeds by mulching, by shallow hoeing or by application of herbicides. The trusses are picked (by hand) with a strig; ripe fruit will hang for up to two weeks, provided it is protected from birds. Netting may be used at this time. There is some harvesting by machine in Europe. The main fruiting season lasts for three weeks but can be extended by one or two late cultivars. Propagate by hardwood cuttings. One-year-old shoots, about 30-40cm long are taken from healthy bushes in the autumn. For bushes grown with a leg and trained forms, all the buds except the top three or four are removed, but this is not done when growing a stooled bush. The cuttings are inserted to about half their length in a trench in the open ground. The rooted plants are transplanted after a year to nursery rows. In that winter prune for subsequent form; for bushes cut back all shoots to four buds; for cordons select the strongest shoot, tie it to a cane and remove the others (choose two shoots for a double cordon). Redcurrants can also be layered, and grafting is used for standard forms. For cultivars that are difficult to root, grafting is also possible or soft-wood cuttings can be taken in early summer and inserted in a peat/sand mixture and rooted under mist. 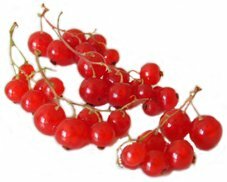 Cultivars include (red currants) ‘Jonkheer van Tets’; very early season; ‘Red Lake’: mid-season; ‘Redstart’, ‘Rondom’: late season; ‘Stanza’: mid-season to late season; (white currants) ‘White Grape’: mid-season; ‘White Imperial’: mid-season. ‘White Versailles’: mid-season.There are also some less-known pink currants, possibly crosses between red and white, including ‘Rosa Hollandische’ and ‘Tinka’. Pests common to currants in Europe and North America include the currant clearwing moth (Synanthedon tipuliformis), known as the currant borer in the US, with larvae that tunnel inside the stems causing an effect like die-back; sawflies (Nematus subspecies), particularly (Nematus ribesii) – referred to in the US as the imported currant worm and in Europe as the common gooseberry sawfly – which has yellow-green larvae with black markings that skeletonise the foliage of blackcurrants; the black currant gall mite (Cecidophyopsis ribis), with a localised distribution in North America, that causes a condition known as ‘big bud’ or ‘reversion’ of black currants; various capsid bugs; the chrysanthemum eelworm (Aphelenchoides ritzemabosi); wingless weevils (Otiorhynchus subspecies) with root-infesting larvae and foliage-feeding adults; several species of scale insects; and red spider mites (Tetranychus urticae). Currants are also attacked by aphids and the redcurrant blister aphid (Cryptomyzus ribis) is present in both continents causing red blistering on red and white currants and a similar yellow blistering on blackcurrants. The black currant leaf midge (Dasineura tetensi), a gall midge, is a troublesome pest in Europe, with small white or yellow larvae up to 3mm long that invade the terminal shoots of blackcurrants, causing young leaves to remain folded and twisted. In North America fruits may be attacked by larvae of the currant fruit fly (Epochra canadensis); infested berries usually fall to the ground and some control can be achieved by collecting and burning the fallen fruits. Ripening currants usually require protection from fruit-eating birds. Currants, gooseberries and other Ribes species are likely to be affected by the same diseases. The leaf spot caused by the fungus Pseudopeziza ribis can result in severe defoliation of blackcurrants but is usually less important on redcurrants, whitecurrants and gooseberries. The brown spots on the leaves turn yellow or appear scorched. Conidia produced on the spots can spread the infection especially in wet summers while the fallen leaves produce ascospores which initiate new infections in the spring. A routine fungicide spray schedule may be needed to control the disease and affected leaves should be collected and burnt. Black pustule disease is caused by the fungus Plowrightia ribesia, a wound parasite which can enter through pruning snags or dead tissue and then spread so as to kill the shoots or even the whole bush. It can be recognised by the oval, black, wart-like pustules on the infected branches. The disease is sometimes associated with coral spot and both diseases are treated by cutting off and burning the affected shoots. A collar rot of old currant and gooseberry bushes, especially redcurrants, is caused by Phellinus (Fomes) ribis, a bracket fungus which produces hard, woody, hoof-shaped fructifications around the base of the plants. Affected bushes should be dug out and burnt. Blackcurrant rust (Cronartium ribicola), also known as white pine blister rust, produces yellow uredospore pustules on the lower surfaces of blackcurrant and, less often, redcurrant leaves; later hair-like columns of brown teliospores may cover almost the entire surface of the leaves. The disease is seldom serious on currants but can be devastating on five-needled pines, especially the Weymouth pine (Pinus strobus), the alternate hosts on which the aecidial stage of the rust occurs. The cluster cup rust (Puccinia caricina variety pringsheimina) is mainly a disease of gooseberries, but currants can also be affected. The orange or red cluster cups, which contain yellow aeciospores, occur on the leaves, fruits and sometimes the shoots. The disease can be controlled by applying protectant fungicides. Urediospores and teliospores of this rust are produced on sedges (Carex subspecies), so these alternate hosts should be eliminated from the vicinity of currant or gooseberry bushes. Redcurrant leaf rust (Puccinia ribis) is rare in Britain but occurs more frequently in Europe and North America; only purple-black teliospores are produced in the life cycle. American gooseberry mildew (Sphaerotheca mors-uvae) is a powdery mildew which can disfigure fruit and cause premature defoliation of currants as well as gooseberries. A regular schedule of fungicide sprays commencing at or before flowering may be necessary but it should be noted that sulphur fungicides can cause damage to some varieties. European gooseberry mildew (Microsphaera grossulariae) also affects both currants and gooseberries but is much less serious than American gooseberry mildew. Currants and gooseberries can also be affected by armillaria root rot (Armillaria subspecies), coral spot (Nectria cinnabarina), crown gall (Agrobacterium tumefaciens), grey mould (Botrytis cinerea) and silver leaf (Chondrostereum purpureum). Reversion is a disease of blackcurrants which affects the size and shape of the leaves and causes a reduction in the number of flowers and thus of fruit yield. It is caused by an unknown but graft-transmissible agent, probably spread by the big-bud mite, Cecidophyopsis ribis. Badly affected bushes should be burnt and replaced with certified, healthy stock and mites should be kept under control. Gooseberry vein banding virus, transmitted by the aphid (Nasonovia ribisnigri), affects currants and gooseberries causing a pale yellow vein banding on the leaves. Affected bushes should be destroyed and replaced with virus-free stock.